Peru Swiss Hostel i Arequipa, Peru: Reservér nu! Peru Swiss Hostel is a brand new in Arequipa, we have 13 private rooms with bathroom, hot shower, tv cable and buffet breakfast included.In Peru Swiss Hostel you will find a nice terrace where you can relax reading a book or drinking a beer. Also you can arrange your trip to the different places around the city and Colca Canyon. We are located only 4 blocks from the main square Plaza de Armas, behind the San Francisco Square where you find many restaurants and pubs. 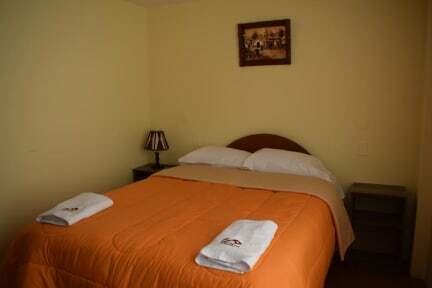 We have Double, twin and familiar rooms, all of then with private bathroom, hot shower, tv cable, wifi access. In addition, we have common areas where the guests and travellers can get together and exchange past experiences and future plans. The tax rate can be exonerated to those passengers who are non-residents in Peru presenting at the check in moment their corresponding passport and immigration card.